Though you can’t make orchid blooms larger, you can encourage a long flowering period with regular applications of fertilizer. You can even encourage some orchids, such as the Phalaenopsis that thrives in U.S. Department of Agriculture plant hardiness zones 10 and 11, to rebloom during a single season. Before you rush to dump fertilizer into the orchid’s potting materials or soil, make sure you choose a food that’s an appropriate strength and balance for your orchid. During the growing season, tropical orchids appreciate a balanced fertilizer, or, if growing in bark, a high-nitrogen fertilizer, such as one with a 30-10-10 ratio of nitrogen, phosphorus and potassium. You can also encourage flowering with a bloom-booster fertilizer in the fall. Phosphorus is the nutrient that speeds the growth of flowers and roots, while potassium aids metabolism – a must during a period of growth and blooming. This makes a 10-30-20 fertilizer an ideal blend for promoting new blooms. Orchids can easily overdose on fertilizer, so dilute it to one-quarter or half strength before applying. When applying phosphorus, 25 to 50 parts per million is enough to encourage flowering. Adding more makes no difference and only wastes fertilizer. This means that if you’re applying a balanced 20-20-20 fertilizer, you only need to use about 1 teaspoon per 2.5 gallons of water. Your fertilizing schedule is just as important as the fertilizer you use. During the growing and blooming period, you can apply quarter-strength fertilizer once a week. Any more than this may burn the orchid roots. Fertilizing through the growing period, typically spring, summer and fall, with a rest during winter dormancy, can help some orchids retain their blooms for several weeks or months. If your orchid fails to bloom, too much fertilizer could be the culprit. Nitrogen is the nutrient responsible for green growth, which means that an overdose of nitrogen can cause your orchid to become tall and leggy at the expense of the blooms. 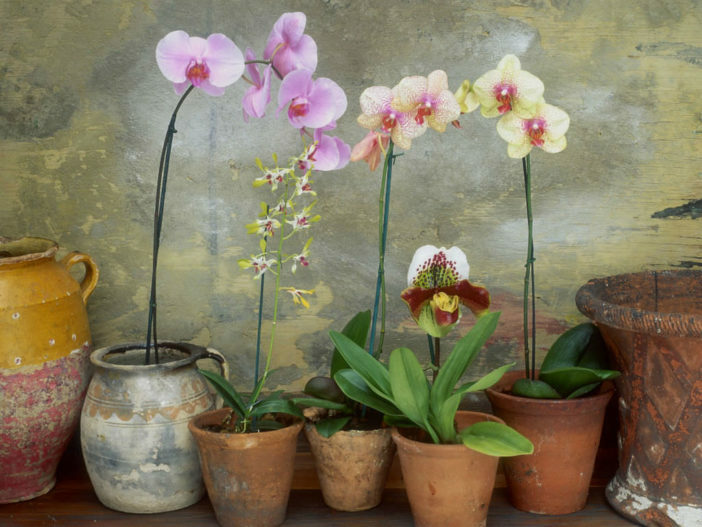 Orchids can survive skipped feedings, so don’t be afraid to rein in your fertilizing schedule to once or twice a month while you find a more balanced formula for your orchid.